Death knell for Republicans in Illinois’s 6th congressional district? This has been a Republican district since the early 1970s. Before that, the District was represented by a Democrat since the late 1920s and dominated by Republicans between the Civil War and 1911. Long-time representative Henry Hyde passing the seat to Peter Roskam may be the recent history but the district has more variation over the years. The demographics of these suburban areas has changed quite a bit. Like many American suburbs, the Chicago suburbs have become increasingly non-white and more diverse in terms of social class. The area covered by the district today is not the same white, middle-class swath that it may have once appeared to be. Roskam replaced conservative icon U.S. Rep. Henry Hyde in Congress, but much of his old territory in eastern DuPage County is now represented by U.S. Reps. Mike Quigley of Chicago and Raja Krishnamoorthi of Schaumburg, both Democrats. 4. The patterns of voting in the Chicago area suburbs mirror larger trends about suburban voters. The 6th district as well as several other House districts are comprised of the middle ground between Democratic voters in the big city and close suburbs and Republican voters in more rural areas and outer suburbs. These are the battleground areas and this will likely continue in future election cycles. All this said, there are no guarantees in this district. Multiple factors could sway voters in this district in the near and far future including changes in what the national parties stand for (and what presidential candidates are leading the way), increasing diversity in the suburbs, possible redistricting, and particular concerns and issues that may resonate voters in the middle suburbs. As the suburbs continue to be important areas for both parties to try to pick up seats, expect this district to continue to be contested for at least a few elections to come. While other parts of the newsletter described what the township does and how residents benefit, this graphic makes one argument: the township does not really ask for much so leave us alone. In relative terms, this is a good argument: townships ask for the least amount of money. Even the Forest Preserve, a rather large one, asks for more money. On the other hand, given property values in the township, even 1.69% can add up to some decent money over the years. Plus, how does the money for townships compare to what residents get from the other taxing bodies? On the whole, the quick appeal to property taxes hints at how suburbanites think: they do not want to pay more in taxes and want to be able to see how the money is being spent. I’m guessing relatively few DuPage County residents could detail what the townships do (compared to other taxing bodies) or connect the township activities to their property values. Other county outliers in the data can be explained by distinct roles some communities serve: Onslow County, N.C., which is connected to much of the country, is home to Marine Corps Base Camp Lejeune. 1. More ties in the other suburban counties and then within Illinois. 2. There are a number of Midwestern ties spread across adjacent states. 4. There are not many ties to the Northeast though other metropolitan areas show ranging from Seattle to Los Angeles to Las Vegas to Nashville. On the whole, DuPage County is pretty wealthy and I would guess fairly mobile. The Facebook connections by location might support that though there are still many Chicago area and Illinois relationships. The finding that Chicago suburbs pay more than get from the state feeds which narrative? Cook County receives 80 cents for every dollar contributed, Lake County gets back 39 cents, Kane County sees 76 cents come back for every dollar, McHenry County sees 42 cents returned and Will County receives 68 cents for every dollar sent to Springfield. “It’s just because geographic politics are powerful, so it’s in the interest of people running for office downstate to say we’re exporting money to fat cats in Chicago and the suburbs,” Martire said. Finding evidence that counters one common narrative can be powerful. Narratives develop over time and take on a life of their own. The downstate versus Chicago narrative – probably more accurately given the realities of metropolitan economies, downstate versus the large Chicago region – has existed for a long time. Arguably, this goes back to the opening decades of the state where much of the population and power existed in the southern and central regions before the opening of the northern part of Illinois to settlement in the 1830s and 1840s. At the same time, this data could be used to promote a different narrative: the Chicago counties are unfairly treated by the state. These counties generate a lot of wealth and are penalized by the state. Why are the good, hard-working taxpayers of these counties penalized for their success? Why can’t the state keep the money generated there to help address the numerous issues present in the Chicago region? Just based on the data, the situation looks pretty unequal. 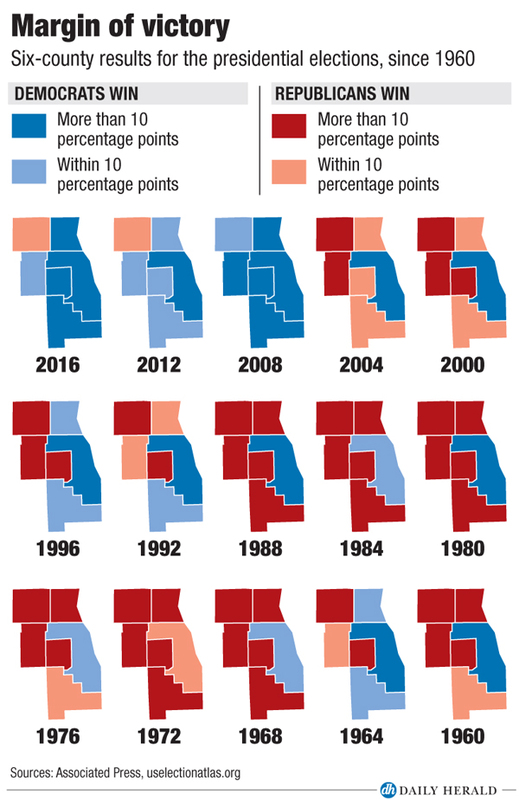 In the long run, this narrative (with evidence) with the sides switched better for Illinois? More broadly, these kinds of analyses of geographic disparities in funding present some really thorny issues for larger governmental bodies such as states and the United States as a whole. Balancing urban versus rural interests also goes back to the founding of our country resulting in key ideas like the Senate being the more powerful chamber with two votes per state regardless of population and the electoral college as opposed to a popular vote. Although no county can place guards at the county line to inspect the socioeconomic and racial characteristics of newcomers, such powers as zoning and control over subdivision and building codes make the county a highly effective arbiter of the types of structures to be built and, hence, the final arbiter of the types of people who will live in its jurisdiction. For example, DuPage County enacts a subdivision ordinance requiring a developer to retain a large portion of his prospective subdivision for public facilities such as parks and schools; the county combines this with a zoning ordinance requiring single-family dwellings and a large minimum lot size. This effectively prohibits a developer from profitably building anything but high-cost housing not accessible to lower-income persons. Stringent county building code standards, requiring expensive building materials and high-quality plumbing, wiring, and heating systems, also serve to increase housing costs. The county’s industrial zoning policy restricting heavy industry serves to limit job opportunity for lower-income persons and to prevent a decline in residential property values surrounding an industrial development – which might create housing opportunities for lower-income groups. Moreover, the county’s relations with various financial institutions make it difficult for a developer to secure financing for a project not approved by the county. Indeed, because of the obstacles the county is capable of placing in the path of a developer, the county’s objection may be sufficient to convince a financial institution that investment in a project would be unwise. And, as the political scientists point out, these were all legal procedures. Local governments, whether at the municipality, township, or county level, often have the power to dictate what can be built on the land over which they have jurisdiction. At the same time, there have been court cases seeking to reverse these zoning powers. In 1971, DuPage County residents and a local fair-housing group brought suit against the county for exclusionary zoning practices. The Mount Laurel cases in New Jersey led to famous decisions suggesting municipalities cannot completely restrict cheaper housing (even if implementation has been messy). To some degree, the plan worked for a while in DuPage County. The authors of Poliscide say the county was the 3rd wealthiest in the nation, businesses were growing, and much of the development was relatively high-end. Yet, things changed over time. In the 2010 Census, DuPage County was the 62nd wealthiest county in the United States. (It would be interesting to analyze what role zoning played in vaulting all those other counties above DuPage County.) In the same census, the white along population was just over 70%. Some of this might be due to how the authors of Poliscide suggest municipalities fought back against the county: they moved to incorporate themselves as well as annex land so that they took over jurisdiction of land and DuPage County had less control over new development. In 2013, state lawmakers gave DuPage the power to eliminate Highland Hills and a dozen other local government entities. If consolidation is working, it is working slowly. A reminder: Illinois leads the way among states with nearly 7,000 local governments. Even when it may look like there are obvious ways to combine government units or get rid of other units, it often requires the approval of residents. Although many would like their taxes to stabilize or go down, giving up local control is also difficult as many then fear a decline in services or that they will have less input to processes that can affect daily life. Bucking historical trends, all but McHenry County in the Chicago suburbs went for Hillary Clinton. The Democratic Party of DuPage got a sudden influx of young foot soldiers, like organizer Alex Franklin, who campaigned for charismatic Democrat Bernie Sanders until the Vermont senator conceded to Clinton in July, then went to work for Clinton. Clinton won DuPage County by 14 percentage points on Tuesday. Shunning the New York billionaire might have cost Illinois Republicans down ballot, said Mark Fratella, a Trump delegate and Addison Township GOP organizer. A variety of explanations. Yet, one is ignored here: the Chicago suburbs have experienced a lot of demographic change in recent decades: more non-white residents, more immigrants moving directly to the suburbs (rather than to neighborhoods of Chicago first), more lower and working-class residents. In other words, the images of Lake County and the North Shore or DuPage County as looking like Lake Forest, Highland Park, Hinsdale, Elmhurst, and Wheaton (all white and wealthy) simply do not hold. The trends are clearly away from Republicans in the collar counties. See earlier posts about presidential candidates fighting over the suburban vote here and here.